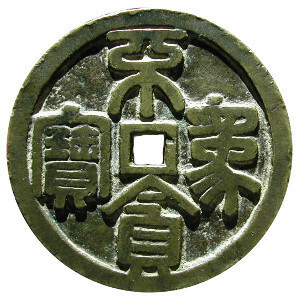 An unusual Chinese charm was recently posted to a popular Chinese coin forum in China. The charm is shown at the left. The inscription bu tan wei bao (不貪為寶) is written in seal script and translates as “not being greedy is a treasure”. The phrase is a reference to a story in the Zuo Zuan (左传), also known as the “Commentary of Zuo”, which is a very ancient text describing historical events during the period 722 BC – 478 BC of the Spring and Autumn Period. The story is about Zi Han (子罕), a high government official of the state of Song, who was known to be virtuous and wise. One day, a peasant came to see him. The peasant had found a stone which an expert had confirmed was a valuable piece of jade. The peasant wanted to present this treasure to Zi Han. Zi Han, however, refused to accept the jade. At the left is the reverse side of the charm. The objects with the curled ends are meant to represent sycee or silver ingots (yuan bao 元宝) which were a form of money in ancient China. The square objects that resemble windows are actually the Chinese character tian (田) which means “field” as in farm land. Land was also a symbol of wealth in ancient China. Liu Xiang (刘向), a government official and scholar during the Han Dynasty, wrote a commentary on the story. 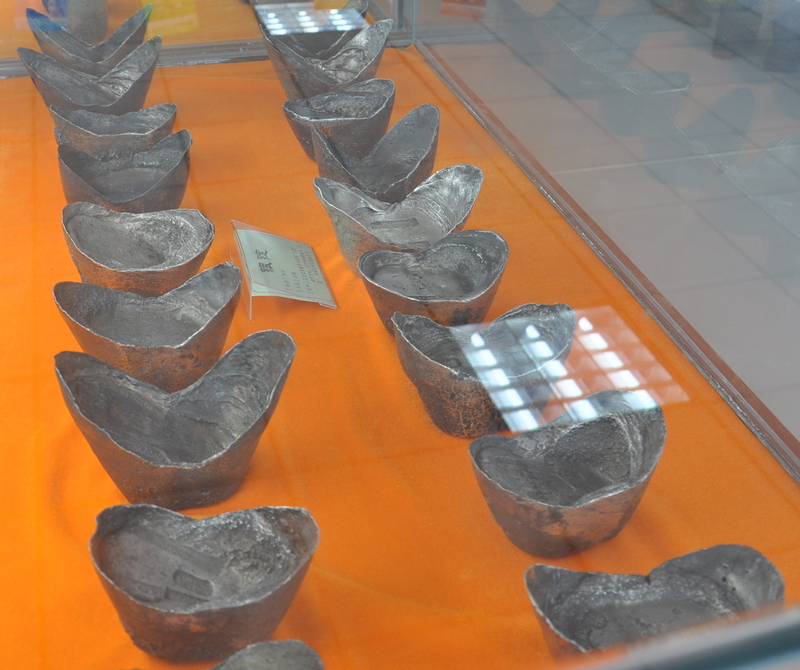 Liu Xiang explained that it was not that Zi Han did not have treasures but that “treasure” meant something different to him. Liu Xiang illustrated his point as follows. If one were to offer a small child a cake or gold, the child would pick the cake. If one were to offer a “lower-class” man the legendary “Jade of He” (和氏璧) or gold, the man would definitely take the gold. However, if one were to offer a wise man the valuable “Jade of He” or a moral principle, the wise man would choose the moral principle. According to Liu Xiang, the better one understands the true nature of things, the better choice one will make. 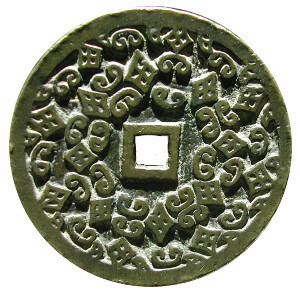 It is noteworthy that the members of the Chinese coin forum had not seen a charm like this before and its appearance resulted in a flurry of more than 200 comments. The forum members universally praised the meaning behind the charm and felt that its posting had been very timely. This is because a well-publicized campaign is currently underway to rid the party and government of corrupt officials. Please also see “Legacy of an Untarnished Reputation” for a discussion of a charm written in “tadpole script” with a similar theme.